To be honest, I had a hard time getting into the story at first. I wasn’t connecting to the story and characters as well as many other readers did, which is fine as we won’t all love the same books. I think I may have been expecting something different. I was a bit confused at times and although I eventually warmed up to the story and to Anna, it did take longer than I expected. I did enjoy the last part of the book so I am glad that I didn’t stop reading. 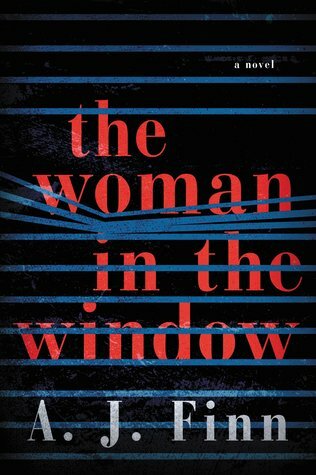 I just read a full page article in Bookpage magazine last night about this author and his debut book, The Woman in the Window. It was quite interesting. After reading the article I thought I might try this book out, although reviews have been mixed on it. Thanks for sharing your excellent review. I still might read it, but probably not immediately. Sounds like an interesting article. I would definitely still give it a try if you’re interested as there are many people who really like it. I’d love to hear your thoughts if you do end up reading it. Have a great weekend and I hope you enjoy your current reads! You too, and thank you!! A lot of people really enjoyed it but for some reason it just wasn’t for me. Like you said we can’t fall in love with all of them.I’m glad that some people have really enjoyed it. TGIF – I hope you have a great weekend! I think we have similar feelings about this one Deanna except i did give up by 20% and put this in my DNF pile. I was just bored and didn’t care for the storyline. Glad you’re enjoying audiobooks more, I love them if they have an engaging narrator! There was a few points that I thought about stopping. I really am starting to enjoy audiobooks. The narrator does make a difference. I’m listening to Pretty Girls Dancing and The Nightingale right now and enjoying both of them. . I put my name on the oh so long library request list for this one. I have read a lot of mixed reviews as well. I have found that when I go in with certain expectations I am often disappointed. I guess I will find out eventually. Nice review. I hope you end up enjoying it! Hopefully won’t have to wait too long. Those library lists can really be long. Having something to read is never a problem. So many good reads that I have added by reading blogs. Nice review, Dee! I’m sorry this didn’t quite work for you but glad it got better towards the end. Hope your next read is better! Thank you very much, Nicole! I’m reading a couple of really good books right now. Happy reading to you as well! I’m glad this was a decent read and had some good twists- and it’s totally understandable if it took more time to get into and you weren’t as invested in the characters- it’s always okay to like different things. Great review! Thank you! This did have some great twist. I’d love to read whatever the author comes up with next. You’re welcome! That’s brilliant 😀 You too!